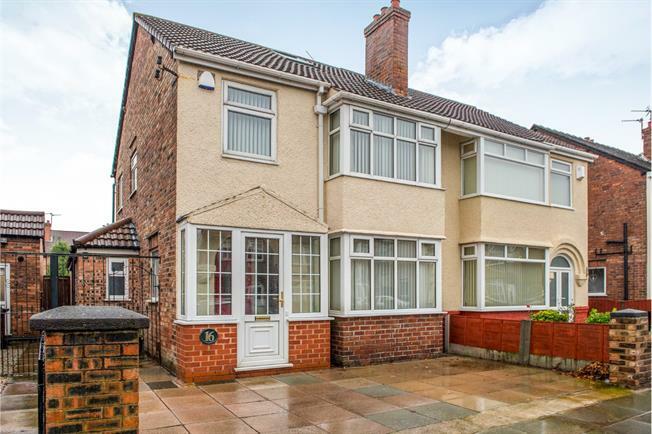 4 Bedroom Semi Detached House For Sale in Liverpool for Offers Over £260,000. Entwistle Green are delighted to offer for sale this well-presented, extended family home which has undergone a series of renovations over the years. This home is in a fantastic location and is perfect for families. The property briefly comprises of an entrance hall, two reception rooms, a kitchen diner, utility room, downstairs WC, three bedrooms, family bathroom and a loft room. The property is double glazed and centrally heated throughout and benefits from a rear garden and driveway to the front. This is not one to miss, call today to arrange your viewing on this beautiful home. UPVC front double glazed door, opening onto the driveway. Double glazed uPVC window facing the side. Radiator, solid oak flooring. Stairs leading up to first floor. Double glazed uPVC bay window facing the front. Radiator and gas fire, carpeted flooring. UPVC French double glazed door, opening onto the garden. Radiator and gas fire, carpeted flooring. UPVC French double glazed door, opening onto the garden. Double aspect double glazed uPVC windows facing the rear overlooking the garden. Radiator, solid oak flooring, tiled splashbacks, vaulted ceiling, spotlights. Built-in units, stainless steel sink, integrated oven, gas hob, overhead extractor, integrated dishwasher, space for fridge/freezer. Solid oak flooring, boiler. Fitted units, space for washing machine, dryer. Double glazed uPVC window with frosted glass facing the front. Radiator, solid oak flooring. Built-in WC, wall-mounted sink. Double glazed uPVC window with frosted glass facing the side. Carpeted flooring. Stairs leading up to the loft room. Double glazed uPVC bay window facing the front. Radiator, carpeted flooring, fitted wardrobes. Double glazed uPVC window facing the rear overlooking the garden. Radiator, carpeted flooring. Double glazed uPVC window with frosted glass facing the side. Heated towel rail, tiled flooring. Built-in WC, panelled bath, shower over bath, pedestal sink. Double glazed velux window. Radiator, carpeted flooring, built-in storage cupboard.